Background and Aims: Breast cancer is one of the leading causes of mortality in Indian women. Although breast cancer is an epithelial malignancy, stroma plays a key role in its development and pathogenesis. Stromal markers are now emerging as novel markers in assessing the prognosis of invasive breast cancer and have not been studied extensively till date. The aim of the present study is to study the stromal expression of CD10 in breast carcinoma, find its relationship with other prognostic markers and study the role stroma plays in breast cancer pathogenesis. Materials and Methods: A total of 70 cases of breast cancer were included in the study. Representative sections were taken and hematoxylin and eosin staining was done. Immunohistochemistry was performed with ER, PR, Her2neu and CD10. Stromal expression of CD10 (>10% stromal positivity was considered positive) in invasive breast carcinoma was noted and was statistically analyzed with different known prognostic markers of breast carcinoma. Results: Stromal expression of CD10 was found to be significantly associated with increasing tumor grade (P = 0.04), increasing mitotic rate (P = 0.33), worsening prognosis (P = 0.01), ER negativity (P = 0.0001), Her2neu positivity (P = 0.19) and with molecular subtypes (CD10 positivity with the HER2 type, and CD10 negativity with Luminal type). No correlation was found between CD10 overexpression and PR, age, menopausal status, tumor size, lymph node positivity and tumor stage. Conclusions: This study gives substantial proof to the various models/research papers explaining the role of stroma/CD10 in breast cancer pathogenesis. Keeping the role stroma plays in predicting prognosis and tumor response, CD10 should be included as a routine pre-chemotherapy marker in breast carcinoma. Further studies should be performed to see the role stroma plays in hormonal expression and the usefulness of CD10 to predict treatment failure in breast carcinomas receiving neoadjuvant therapy. Background: Etiology of nearly 30% cases of chronic viral hepatitis remains undetected. Occult HBV infection (OBI) has emerged as an important clinical entity in this scenario. Apart from prevalence and clinical outcome of OBI patients genotype was determined in northern region of India. Materials and Methods: A total of 847 patients with chronic liver disease (CLD) were screened for common viral etiologies and others serological markers of HBV. Amplification of surface, precore and polymerase genes of HBV was performed in patients negative for other etiologies. 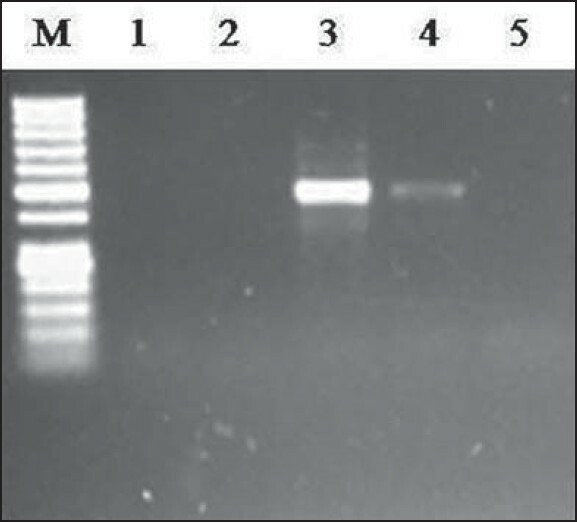 Genotyping and sequencing of the precore region was performed for OBI cases. Results: Twenty-nine (7.61%) cases of OBI were identifiedof which 9 had chronic liver disease (CHD), 11 liver cirrhosis (LC) and 9 hepatocellular carcinoma (HCC). Majority of OBI cases were detected by amplification of surface gene 26 (89.6%), followed by pre-core gene 12 (41.3%). Their liver functions tests were significantly deranged in comparison to overt HBV cases. IgG anti HBc was present in 8 (27.6%) OBI cases. Mutation was observed in 8 (32%) in pre-core region at nt. 1896 of overt HBV cases. Genotype D was the predominant genotype. In conclusion: OBI in our study was characterized by predominance of genotype D and more severe clinical and biochemical profile in comparison to overt HBV. IgG anti HBc positivity could be utilized as a marker of OBI. We recommend use of sensitive nested PCR for diagnosis of OBI, amplifying at least surface and precore gene. Introduction: Hemangioblastomas (HBs) are rare WHO grade I neoplasms of uncertain histogenesis. Most are sporadic and association with von Hippel-Lindau disease (VHL) is uncommon. Materials and Methods: Histomorphological and immunohistochemical evaluation of 24 cases of HBs was done. Results: Age range was 15-68 yrs (median: 30 yrs) with male:Female of 1.2:1 (M-13; F-11). Cerebellum was commonest location (n = 20), one each was seen in brain stem, cervical spinal cord, fourth ventricle and frontal lobe, respectively. VHL association was noted in 5 cases. Four cases were recurrent in nature of which 3 were in association with vHL. 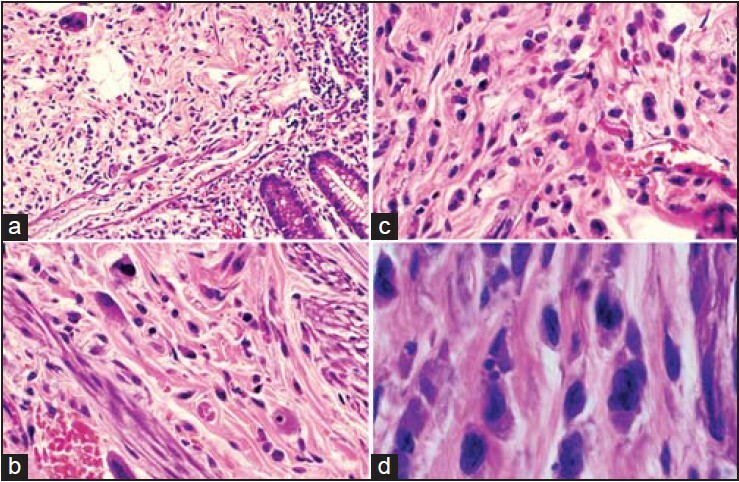 Histologically, reticular variant was the predominant subtype (n = 15), 5 were of cellular variant and 4 were mixed. Nuclear pleomorphism, nuclear cytoplasmic inclusions, cytoplasmic vacuolation were noted in the stromal cells in varying proportions. Immunohistochemical evaluation was successful in only 11 cases and of which 8 showed stromal cell positivity for alpha-inhibin. CD56 (NCAM), Nestin and synaptophysin positivity was seen in 6, 7 and 4 cases, respectively. Nestin positivity was noted in stromal cells only and no reactivity with the endothelial cells seen. S-100 protein and NSE positivity was seen in 8 and 10 cases, respectively. Glial fibrillary acidic protein (GFAP) showed two distinct patterns of immunoreactivity - scattered stromal cell positivity (n:5) and pattern of reactive astrogliosis positivity (n:10). CD44 positivity was noted in 5 cases. VEGF and EGFR positivity was seen in 5 cases each. None of the cases showed positivity for epithelial membrane antigen and no stromal cells in any of the cases showed positivity for CD34 and CD31. Conclusion: HBs can occur in throughout the neuroaxis. Cerebellum is the commonest site of occurrence for HBs and uncommonly can occur in the supratentorial compartment and spinal cord. Its association with vHL is uncommon and no histological or immunohistochemical correlation was identified with the same. 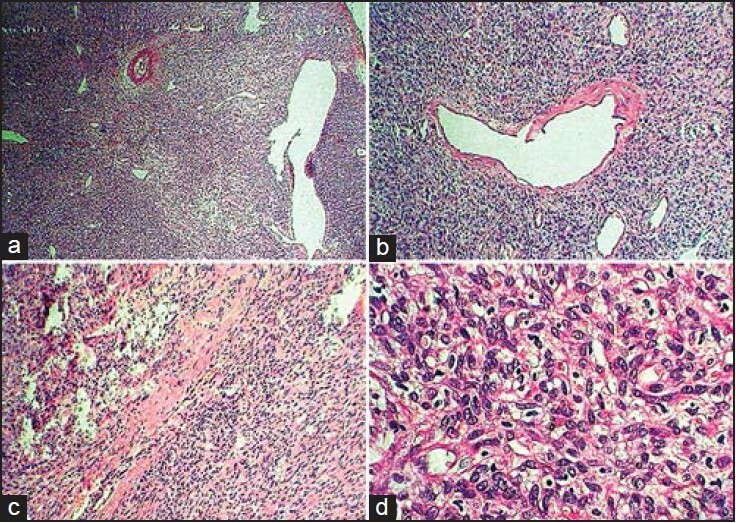 Background: Insulin-like growth factor (IGF), transforming growth factor-beta1 (TGF-β1), and vascular endothelial growth factor (VEGF) are commonly studied growth factors, but little data are available on the immunohistochemical expression of these factors in parathyroid lesions. 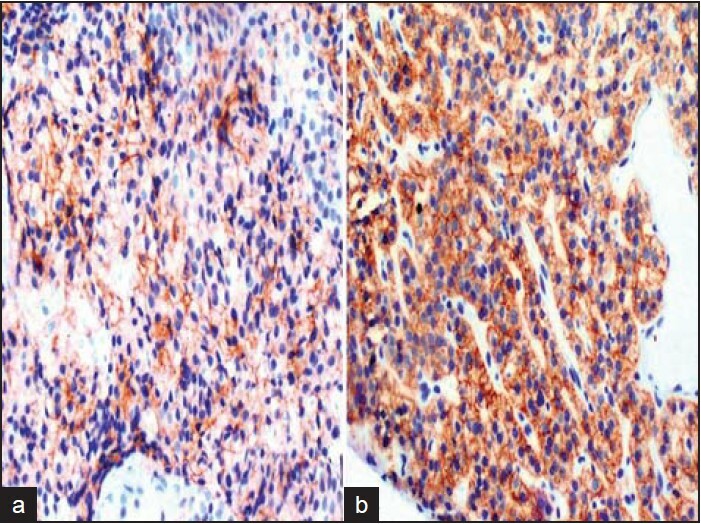 Materials and Methods: Tissue specimens from 36 patients with primary hyperparathyroidism (P-HPT) (26 adenomas and 10 primary hyperplasias) were examined. Normal parathyroid tissue adjacent to the adenoma or area of hyperplasia was used as control tissue. Preoperative laboratory testing [serum Ca and P, creatinine and parathormone levels (PTH)] which led to the diagnosis of P-HPT had been performed, the size and weight of the parathyroid glands measured, and postoperative serum PTH levels determined. 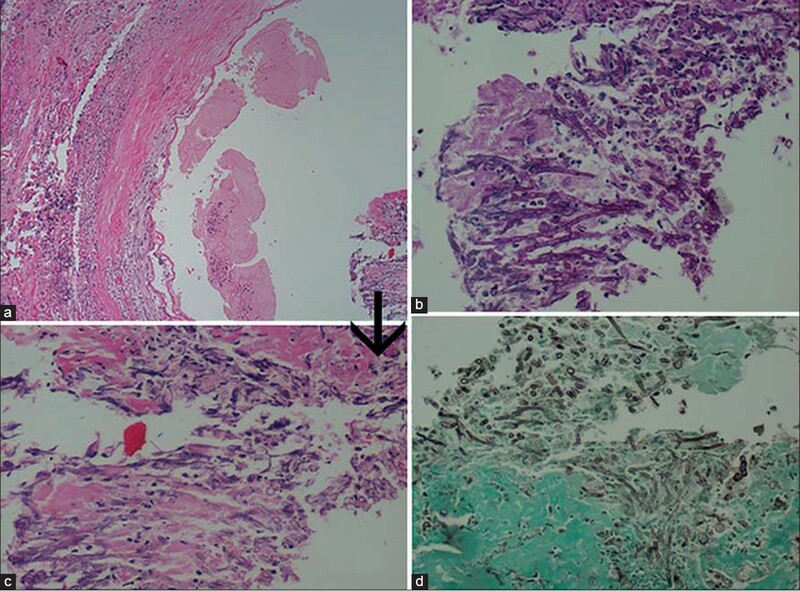 Paraffin-embedded parathyroid tissue specimens were stained with antibodies to IGF-1, VEGF, and TGF-β1 using standard immunohistochemical procedures. Results: IGF-1 immunoreactivity was seen in 50% of hyperplasia and in 46% of adenoma samples, but in 87% of normal parathyroid tissue in the vicinity of the adenomas (P = 0.005). TGF-β1 immunoreactivity was observed in 90% of hyperplasia, in 92% of adenoma samples, and in 95% of normal tissues around adenomas. VEGF immunoreactivity was observed in 70% of hyperplastic and 65% of adenomatous tissues, as well as in 54% of normal tissues in the vicinity of the adenoma. No significant differences in the expression of IGF-1, TGF-β1, and VEGF were observed between primary adenomas compared to hyperplasia samples (P > 0.05). Conclusions: Parathyroid tissue is clearly a site for production of IGF-1, TGF-β1, and VEGF. IGF-1 receptor activity was higher in normal parathyroid tissue compared to hyperplastic and adenomatous tissue. Aim: Studies reveal that invasive tumor front may be the best field for quantification of proliferative and apoptotic markers. 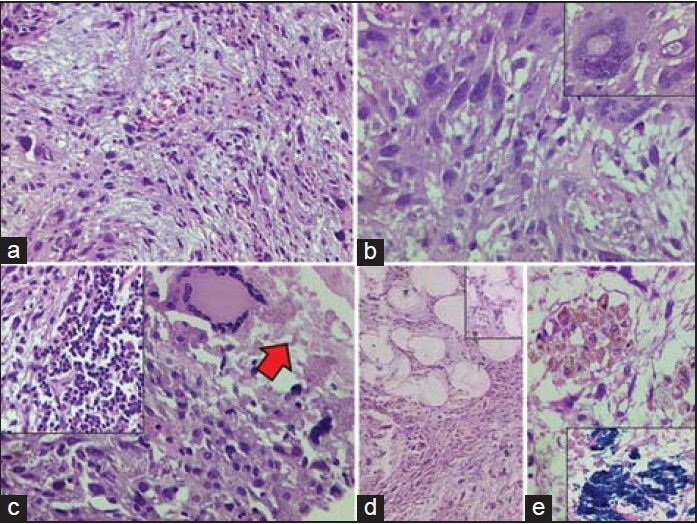 The current study assessed the expression of Ki-67 antigen and p53 protein at invasive tumor front of oral squamous cell carcinoma (OSCC) and correlated the immunostaining with the histologic grades of malignancy. Materials and Methods: A total of 80 slides sample was prepared for the study, one each from ten normal oral mucosa cases and two each from 30 OSCC cases. 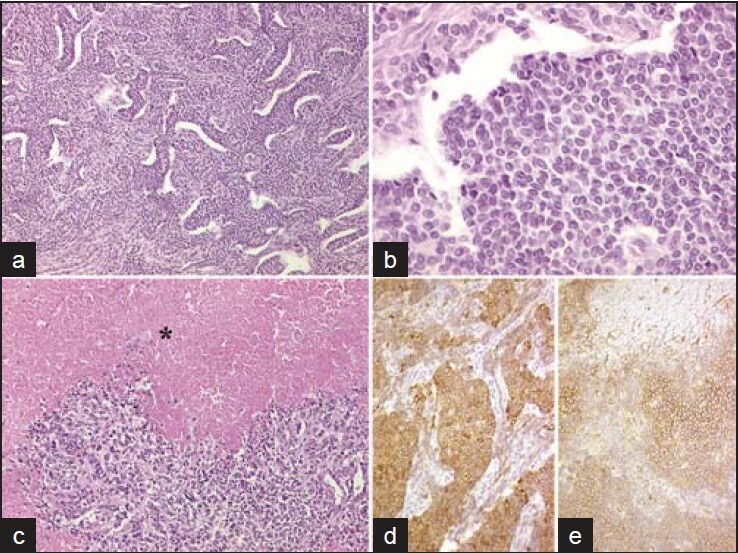 The OSCC patients were biopsied along invasive tumor front, and samples were immunohistochemically analyzed for the expression of both Ki-67 antigen and p53 protein. Results: Of the total 30 OSCC cases, the expression of p53 was found positive in 20 cases (66.6%), while Ki-67 expression was found positive in 21 cases (70%). All the cases in the control group were negative. A higher p53 and Ki-67 expression were seen in OSCC group as compared to normal mucosa. On comparing the control group with various grades of OSCC a statistically significant result was obtained. Conclusion: Higher and statistically significant expression was noted for both p53 and Ki-67 antigen. The results emphasize the potential of Ki-67 and p53 as biomarkers of carcinogenesis in OSCC. Ki-67 expression was comparatively higher when compared with p53 except in poorly differentiated squamous cell carcinoma and signifies actively proliferating malignant cells at invasive tumor front. Context: Well-differentiated liposarcoma (WDLPS) is the most common type of liposarcoma and sometimes can be difficult to distinguish from large lipoma due to the similar morphology. Aims: This study proposed to evaluate the expression and amplification of Murine double minute 2 (MDM2) gene and determine its correlation with Ki67 proliferation index. Settings and Design: This study used cross-sectional design. 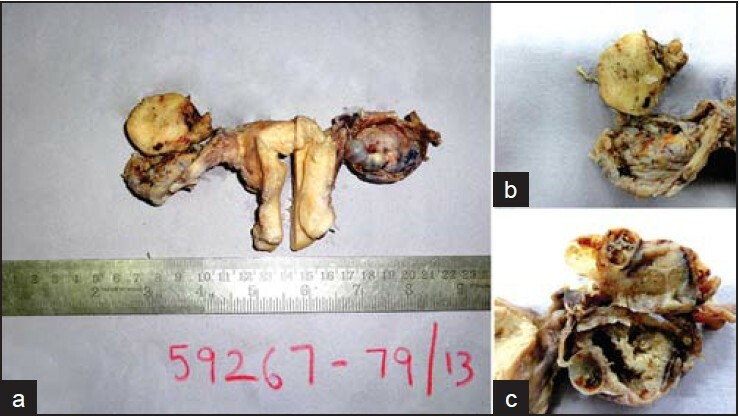 Materials and Methods: This study enrolled 37 cases of lipomatous tumors with >5 cm in size. Eighteen cases of WDLPS and 19 cases of lipoma were stained for MDM2 and Ki67 immunohistochemistry, followed by MDM2 in situ hybridization in 12 selected cases. Statistical Analysis Used: MDM2 overexpression and amplification status for both groups were compared using Chi-square test, with the alternative of Fisher's exact test. Correlation test between MDM2 overexpression and clinical characteristics with the Ki67 proliferation index were performed using Pearson's test with the alternative of Spearman's rho test. Results: MDM2 overexpression was detected in all WDLPS cases and in 3 (16%) of lipoma cases with significance difference (P = 0.000), whereas MDM2 amplification was found in all WDLPS and in 1 of lipoma cases (P = 0.200). There was a strong correlation between MDM2 overexpression and higher Ki67 proliferation index (r = 0.645, P = 0.000). Conclusion: Evaluation of MDM2 overexpression can be used as a useful adjunct to differentiate WDLPS from large lipoma and seems to be related with Ki67 proliferation index. Background: Granulosa cell tumor of testis is a rare tumor accounting for less than 4% of adult testicular tumors though they account for nearly 30% of childhood testicular tumors. Due to the rarity of these tumors, exact etiology, pathogenesis, prognostic factors and best treatment approach are not well known. The molecular events in pathogenesis of these stromal tumors have begun to unravel and these developments put forth a reasonable and scientific explanation for the association of these tumors with developmental anomalies like undescended testis. However, many questions remain unanswered. 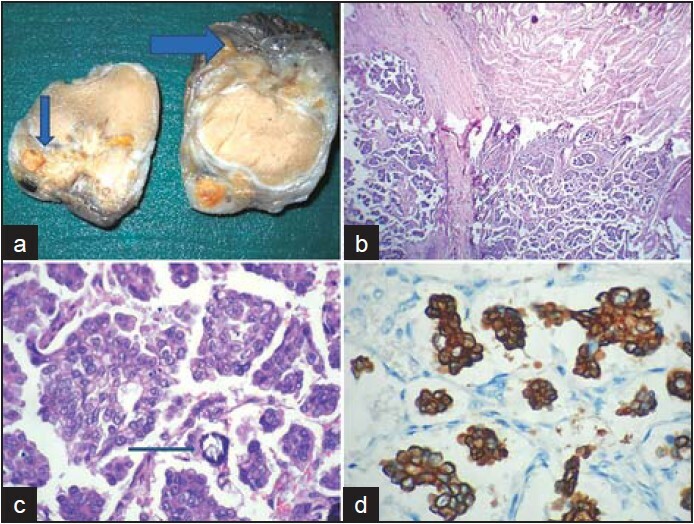 Materials and Methods: We performed a retrospective analysis of clinicopathological features of all Granulosa Cell Tumors of testis from our archives in addition to an extensive literature search using PUBMED with the key words "Granulosa Cell Tumor, testis". Results: We found six cases in our archives, two of which were of juvenile type and four of adult type. One out of these six cases presented with metastases. All cases underwent radical orchidectomy. Morphology and immunohistochemistry were classical in all cases and there was no diagnostic dilemma. 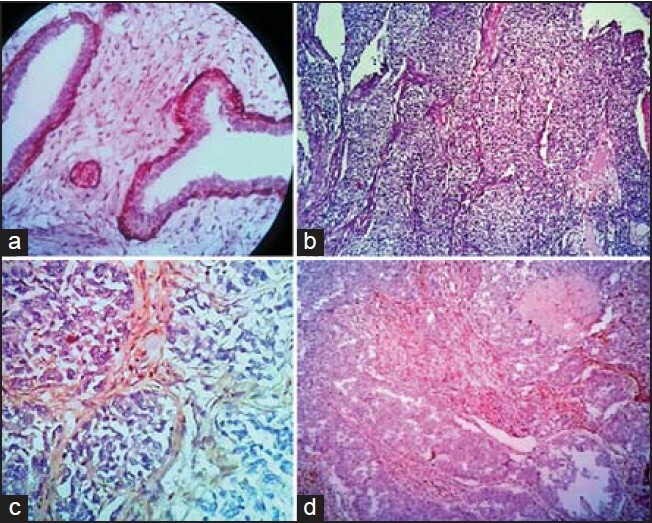 Literature search revealed 63 cases of testicular Granulosa Cell Tumor in addition to highlighting the similarities in the biology and the dissimilarities in the clinical behavior as compared to ovarian Granulosa Cell Tumor. Conclusion: Testicular Granulosa Cell Tumor is a rare tumor, which although histologically similar to its ovarian counterpart, differs in clinical behavior. Further detailed investigations are needed to reveal the mystery behind the differing clinical behavior despite histological and immunohistochemical similarity between the testicular and ovarian Granulosa Cell Tumors. Background: The diagnosis of tuberculosis (TB) depends on identification of the infecting organism. The diagnosis presents as a challenge due to its diverse clinical presentation and low yield of acid-fast bacilli (AFB) in tissue sections. Aim: The aim of the present study is immunohistochemical localization of tubercle bacilli or their components that persist in the granulomas, but have lost the property of staining with acid-fast stain, assess the advantage of immunostaining over conventional Ziehl-Neelsen (ZN) staining and further to study the staining pattern on immunohistochemistry (IHC). Materials and Methods: The study population comprised 100 suspected cases of TB. 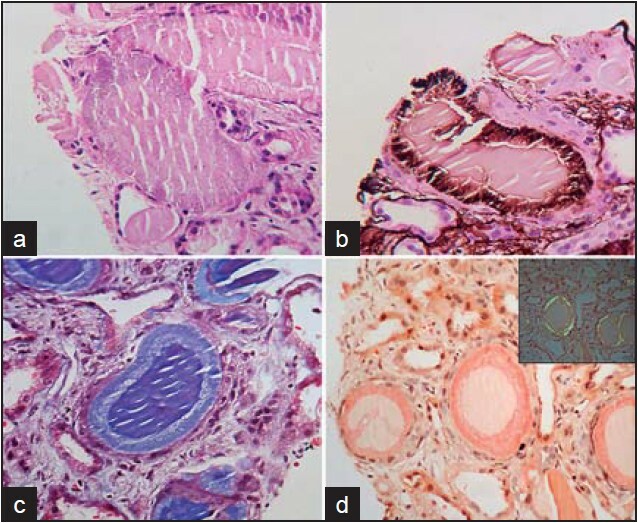 Tissue sections from these were subjected to hematoxylin and eosin, ZN and IHC staining using polyclonal antibody to Mycobacterium tuberculosis followed by a comparative analysis of the results. Cases of lepromatous leprosy were used as a positive control. Results: Acid-fast bacilli were identified by ZN stain in 23% of cases. IHC identified 72% cases. In the present study, IHC had higher sensitivity (95.56%) and negative predictive value (96.43%), but lower specificity (35.06%) and positive predictive value (30.56%) than ZN stain which had the sensitivity, specificity, positive predictive value and negative predictive values of 30.56%, 96.43%, 95.65% and 41.56% respectively. 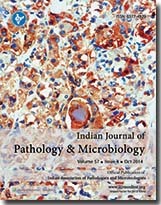 Conclusion: Immunohistochemistry is a simple and sensitive technique for localization of tubercle bacilli and their components on tissue sections. It can be easily incorporated in routine histopathology laboratory and serve as an efficient diagnostic adjunct to conventional ZN staining. This will help reduce the practice of prescribing empirical antitubercular treatment based on clinical suspicion alone. Introduction: Pseudomonas aeruginosa is a potent opportunistic nosocomial human pathogen among Gram-negative bacteria causing various life-threatening infections in patients from Intensive Care Units. This bacterium has become resistant to almost all commonly available antibiotics with limited treatment options. Multi drug resistant P. aeruginosa (MDRPA) is a major cause of concern among hospital acquired infections. It uses distinctive resistant mechanisms virtually to all the available antibiotics such as Metallo β-lactamases (MBL) production, extended spectrum β-lactamase production (ESBL), up regulation of efflux systems related genes and decreased outer membrane permeability. This study was carried out to find one the predominant resistance mechanisms among MDRPA and the prevalence of corresponding resistance genes. Materials and Methods: MDRPA isolates collected from various clinical samples for a period of 1-year (November 2009-Octo ber 2010) were included to detect the predominant mechanism of resistance using phenotypic and molecular methods. Molecular characterization of all these isolates was done by polymerase chain reaction (PCR) for the presence of blaVIM-2, blaIMP-1, blaOXA-23, and blaNDM-1 genes with specific primers. Results: Among 75 MDRPA isolates 84% (63) were MBL producers. Molecular characterization studied by PCR showed the presence of blaVIM-2 gene in 13% of MBL producers. Conclusion: The prevalence of MBLs has been increasing worldwide, particularly among P. aeruginosa, leading to severe limitations in the therapeutic options for the management. Thus, proper resistance screening measures and appropriate antibiotic policy can be strictly adopted by all the healthcare facility providers to overcome these superbugs. Aims and Objectives: The aim was to investigate the correlation between histological and culture diagnosis of filamentous fungi. 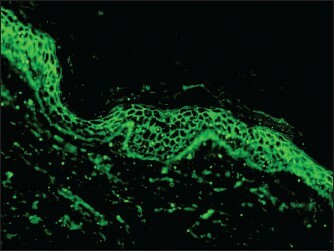 Materials and Methods: Tissue sections from biopsy samples stained with Hematoxylin and Eosin and special stains from samples of chronic invasive/noninvasive sinusitis and intracranial space occupying lesions during 2005-2011 diagnosed to have infection due to filamentous fungi were reviewed. The histopathology and culture diagnoses were analyzed for correlation and discrepancy. Results: There were 125 samples positive for filamentous fungi on biopsy. Of these 76 (60.8%) were submitted for culture and fungi grew in 30 (39.97%) samples. There was a positive correlation between histological and culture diagnosis in 25 (83.33%) samples that included Aspergillus species (16/19), Zygomycetes species (8/10) and dematiaceous fungi (1/1). The negative yield of fungi was more in Zygomycetes species (20/30) when compared to Aspergillus species (25/44). There was a discrepancy in diagnosis in 5/30 (16.67%) samples which included probable dual infection in two, and dematiaceous fungi being interpreted as Aspergillus species in three samples. Conclusion: Histopathology plays a major role in the diagnosis of infection due to filamentous fungi, especially when cultures are not submitted or negative. The discrepancy between histological and culture diagnosis was either due to dematiaceous fungi being interpreted as Aspergillus species or probable dual infection. Biliary Tract Intraductal Papillary Mucinous Neoplasm (BT-IPMN) is a very rare entity, gradually emerging into attention as sporadic cases are being reported worldwide. In this brief report we discuss about such an entity from our part of the world, based on a case from our institution. A 47-year-old female was referred to our department with jaundice, intermittent fever with chills and rigor of 6 weeks duration. Initial evaluation revealed obstructive jaundice with distended gall bladder. Imaging with ultrasonogram (USG) and magnetic resonance imaging (MRI) showed hugely dilated intra and extrahepatic biliary radicles with multiple and diffuse soft tissue lesions filling the common bile duct (CBD) extending to the ductal system of left lobe of liver. 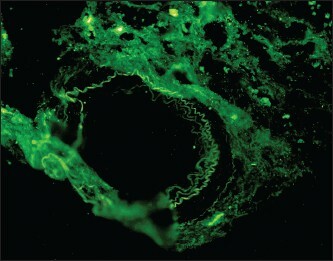 A side viewing endoscopy demonstrated mucin extruding from a prominent ampulla of Vater. The patient was managed successfully by left hepatectomy with pancreaticoduodenectomy (HPD). 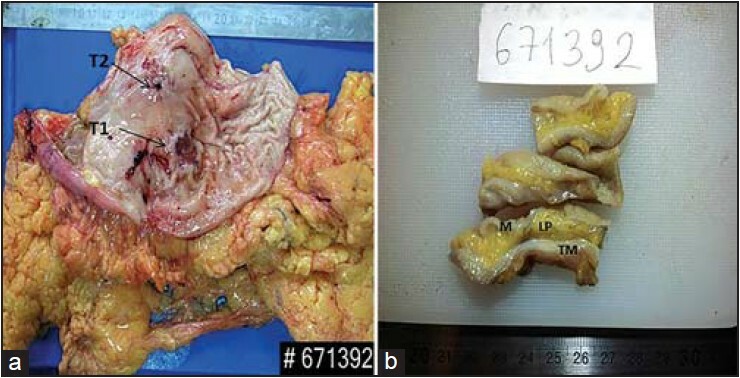 Gross pathological examination of the specimen showed marked dilatation of intra and extra hepatic bile ducts with multiple polypoidal lesions and plenty of mucin filling the entire biliary ductal system. Histopathology revealed predominantly intraductal papillary mucinous adenocarcinoma at the hilum extending to left bile duct with diffuse dysplastic changes throughout the biliary tree. Thus the clinical, radiological and pathological features of this lesion clearly fit into the diagnosis of BT-IPMN, which is slowly being established as a definite clinical entity with features much similar to its pancreatic counterpart. Aim: To describe the clinicopathological features in patients with fungal infections of the central nervous system (CNS) presenting as mass lesions. Materials and Methods: A retrospective analysis of records obtained from 10 patients was done with histopathologically confirmed fungal infections presenting as ICSOL, diagnosed in the department of pathology. 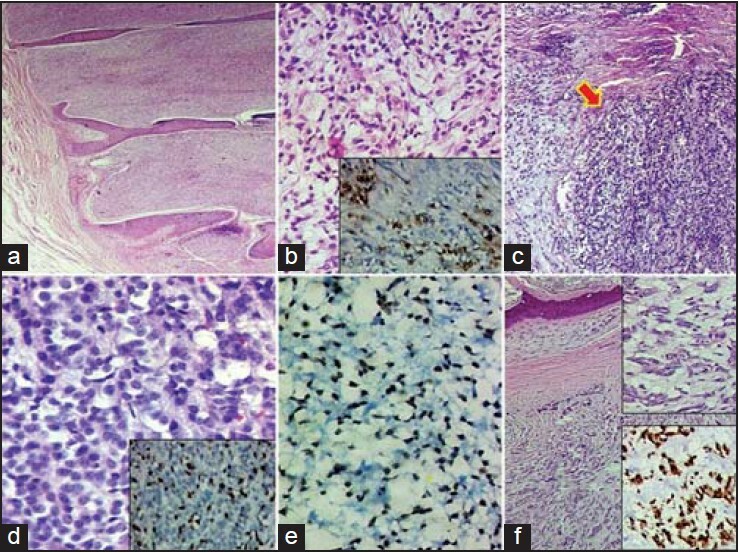 Clinical features at presentation, findings of radiological investigations performed and histopathology were noted for each patient and subjected for analysis. Results: Infection was higher in males, and paranasal sinusitis was the most common predisposing factor. Location was intraparenchymal followed by sphenoid wing. 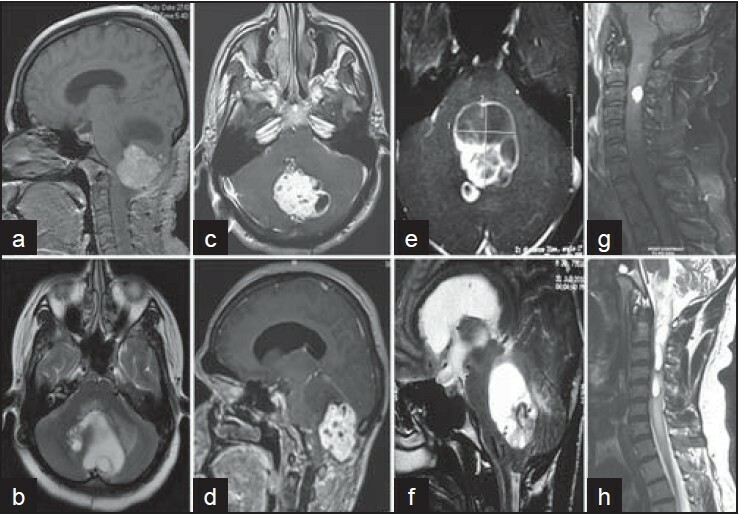 Four dural-based lesions mimicked meningioma clinically. The most common fungus identified was zygomycosis (seven cases), followed by phaeohyphomycosis (two cases) and aspergillosis (one case). Conclusion: There is a rising trend of CNS mycosis, both in immunocompromised and immunocompetent patients. 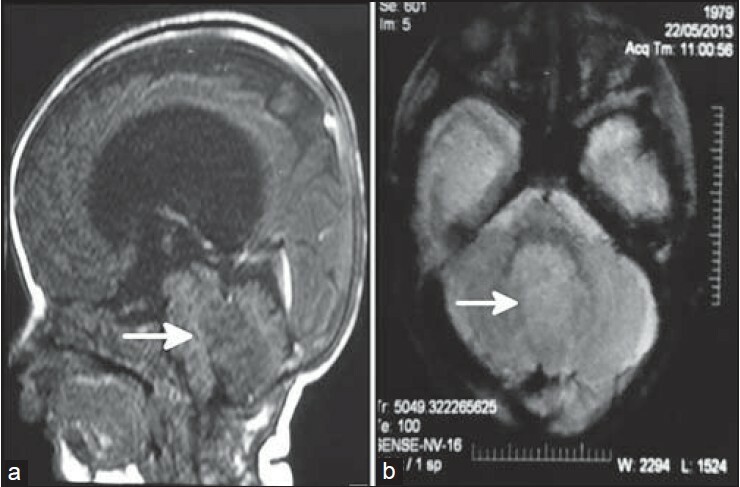 Intracranial fungal granuloma may mimic radiologically as glioma or meningioma, therefore a high index of suspicion is needed to detect early CNS fungal infections, especially in immunocompetent young patients with no predisposing illness. Fungi should always be excluded in patients with inflammatory or granulomatous pathology of CNS. With the increase in invasive fungal infections due to Candida species and resistance to antifungal therapy, in vitro antifungal susceptibility testing is becoming an important part of clinical microbiology laboratories. 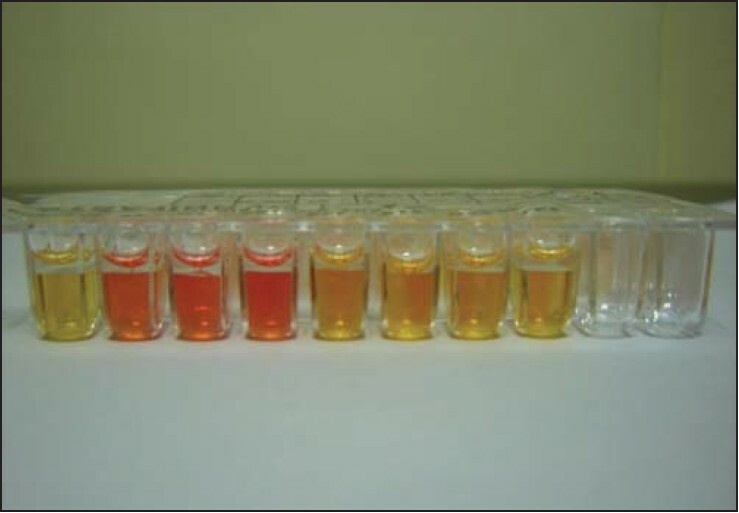 Along with broth microdilution and disk diffusion method, various commercial methods are being increasingly used for antifungal susceptibility testing, especially in the developed world. In our study, we compared the antifungal susceptibility patterns of 39 isolates of Candida to three antifungal drugs (fluconazole, amphotericin B, ketoconazole) by Candifast and disk diffusion method. The following resistance pattern was found by Candifast: Fluconazole (30.8%), ketoconazole (12.8%), amphotericin B (0%). The results obtained by disk diffusion method were in complete agreement with Candifast results. Papillary thyroid carcinoma (PTC) and medullary thyroid carcinoma (MTC) are two distinct types of thyroid carcinoma with considerable difference in terms of cellular origin, histopathological appearance, clinical course and prevalence. The histogenetic origin and possible molecular mechanisms responsible for the development of mixed medullary-papillary carcinoma of the thyroid are still unclear. The most widely accepted hypotheses considering co-occurrence of MTC and PTC are stem cell theory, collision effect theory and hostage theory. Herein we describe two rare cases of mixed medullary-papillary thyroid carcinoma with co-occurrence of MTC and PTC which developed with concomitant MEN 2A and different sites of lymph node metastasis in the first patient, while with atypical clinical presentation in the second patient. 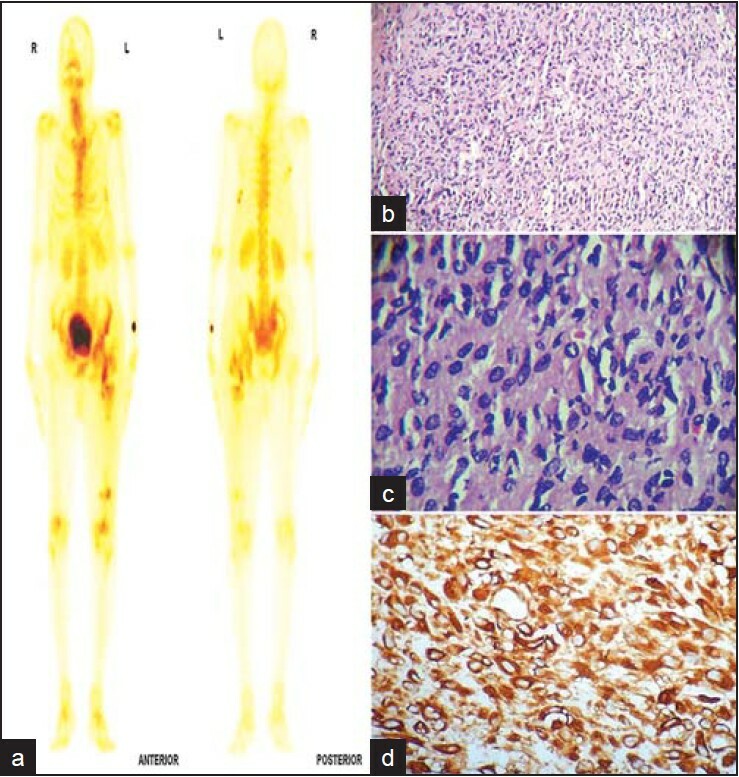 In conclusion, co-expression of thyroglobulin, synaptophysin and chromogranin by the papillary component of mixed tumor seems to support stem cell theory in our first case, whereas positive staining for calcitonin but not for thyroglobulin in the medullary component of the tumor along with separation of these two tumors from each other by a normal thyroid tissue seem to indicates the likelihood of collision effect theory in our second case. Hemangiopericytoma (HPC) is a rare tumor that arises from pericapillary cells or pericytes of Zimmerman. In the central nervous system, it accounts for less than 1% of tumors, and spinal involvement is very rare. Meningeal hemangiopericytomas show morphological similarities with meningiomas particularly with angiomatous meningioma, where one needs to take the help of immunohistochemistry (IHC) to delineate HPC from meningioma. 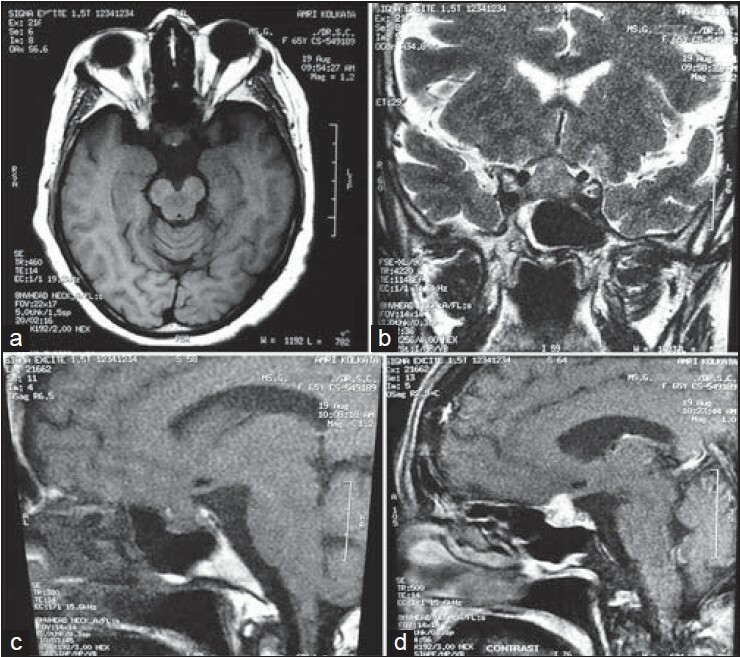 Here, we report a case of recurrent extradural HPC in a 16 year-old girl, who 5 years back had a pathological diagnosis of angiomatous meningioma, for D5-D6 lesion. 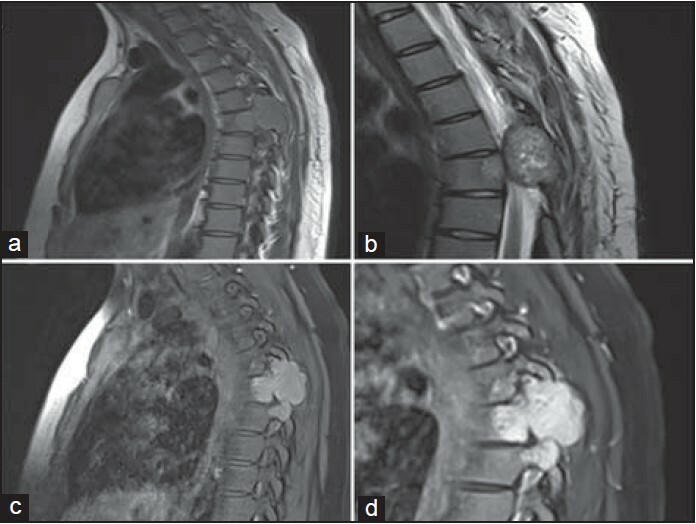 On evaluation, magnetic resonance imaging (MRI) showed a large extradural tumor with a significant cord compression involving D5-D6 body, pedicle and ribs. Excision of the lesion and spinal stabilization was performed. The histopathological examination and immunohistochemistry performed on tumor sections revealed features favoring HPC. To conclude, detailed IHC is helpful in avoiding misdiagnosis and in further management of the patient. 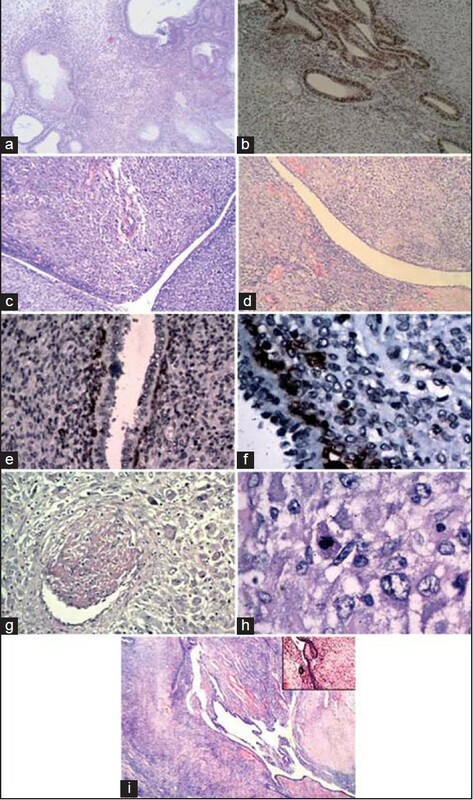 Endometrial stromal sarcoma (ESS) has a wide histopathological spectrum with CD10 as its diagnostic marker. Recently, few non-conventional ESSs have been identified that lack diffuse CD10 expression. A 46-year-old, perimenopausal lady referred to us with history of vaginal bleeding. On clinical examination and radiological imaging, a polypoid endometrial tumor was identified. 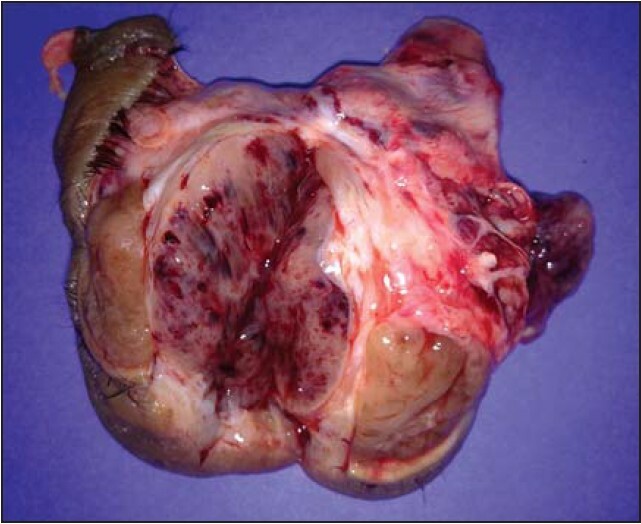 Hysterectomy revealed a multinodular tumor in the myometrium. Microscopically, the tumor composed of rather banal oval to spindle-shaped cells in a fibromyxoid stroma. 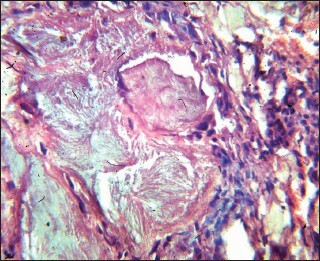 Focal areas displayed compact cellular arrangement, unassociated with significant mitoses and necrosis. Immunohistochemically, tumor cells were focally positive for CD10, estrogen receptor, progesterone receptor, p16INK4 and were diffusely positive for cyclinD1. Diagnosis of cyclinD1 and p16INK4 positive ESS was offered. 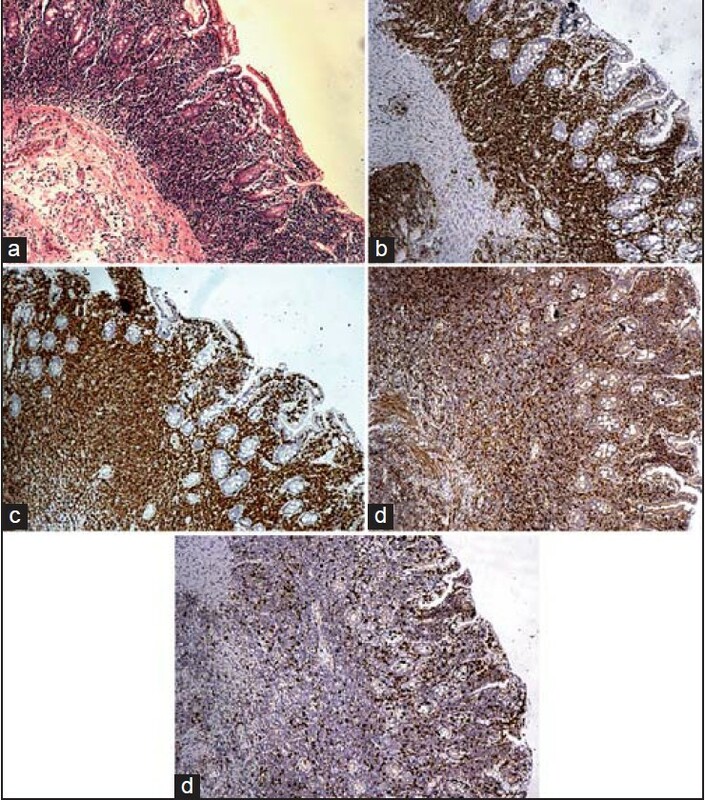 This case highlights the value of additional IHC markers, especially cyclinD1 and p16INK4 in order to identify certain ESSs that lack diffuse CD10 immunoexpression; are invariably misdiagnosed as undifferentiated sarcomas, but actually form a relatively more aggressive subset of ESSs. Hemangioendotheliomas are rare vascular tumors that can arise from soft tissue or bone. The former comprises hemangioma, epithelioidhemangioma, hemangiomatosis and massiveosteolysis or Gorham's disease (which mimics malignantneoplasm due to aggressive osteolytic destruction). The rarer malignant counterparts are epithelioidhemangioendothelioma, hemangioendothelioma and angiosarcoma in increasing order of malignancy. The diagnosis of these lesions is difficult both clinically and radiologically. Hereby we report an unusual case which was mistaken for metastasis and was diagnosed with the help of histopathology. 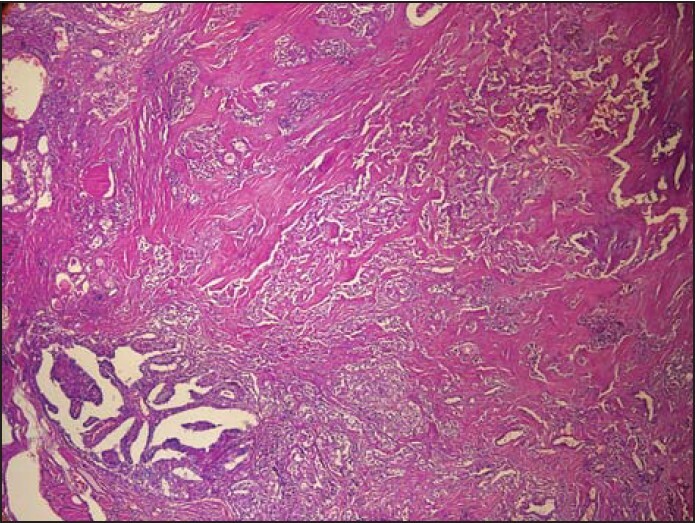 Adenoid cystic carcinoma (ACC) is a rare tumor with characteristic histologic features. 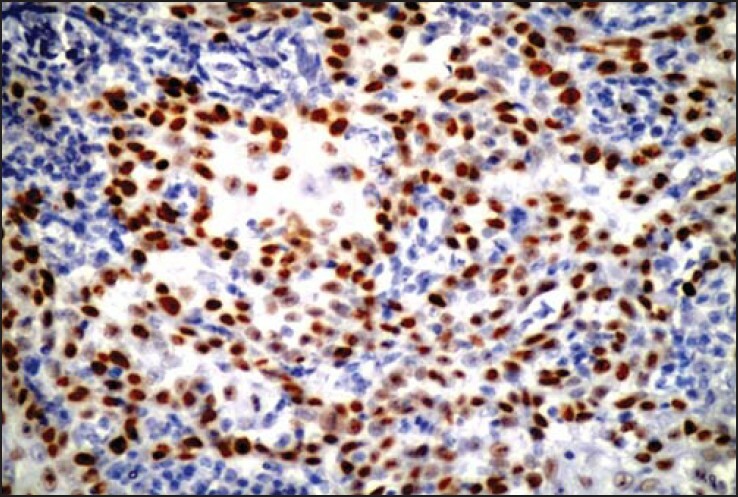 Staining with basal markers for estrogen receptor, progesterone receptor, and HER2 usually shows negative results. Immunohistochemical analysis of C-kit and MYB overexpression of the ACC also has been reported. We report two cases of ACC of the breast with C-kit and MYB overexpression that clinically confirm these previously reported characteristics and suggest that further molecular study of the expression of these two proteins can lead to future therapeutic strategies. Ovarian-type surface epithelial carcinomas of testis and paratestis are very rare. These tumors develop from mesothelial inclusions or abnormalities in the development of coelomic epithelium. The diagnosis of these lesions can be difficult, both clinically and radiologically, as morphological, immunohistochemical and ultrastructural features overlap with serous tumors arising in the female genital tract. The pathologist should be aware of the histopathological features and immunostains which help in reaching definite diagnosis. To the best of our knowledge only one such case has been reported in Indian literature. We hereby report a case of young male with this unusual lesion diagnosed on histopathology. Liposarcoma is the most common sarcoma in adults, but is an extremely rare tumor of the orbit. We report 4 cases of primary orbital liposarcoma treated at our center. All cases had tumor localized to the orbit and underwent exenteration followed by radiotherapy in one patient. None of the patients had a recurrence until a follow-up of 1-5 years (mean: 4 years). 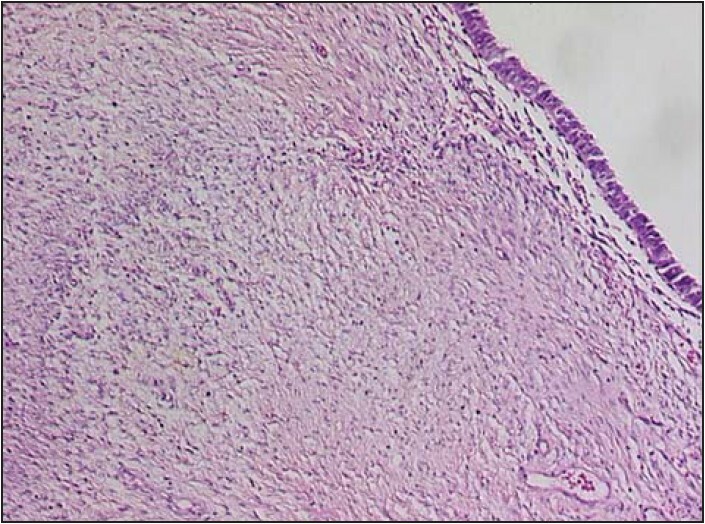 Female adnexal tumor of probable Wolffian origin (FATWO) is a rare neoplasm arising from the remnants of the mesonephric duct. 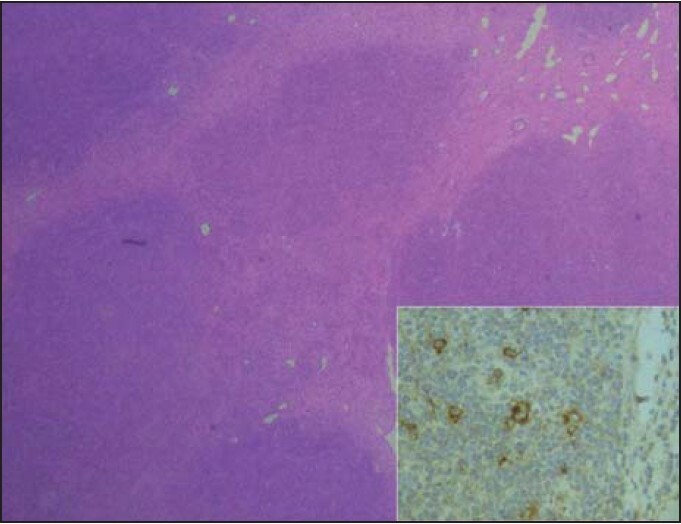 We report here a case of FATWO in a 70-year-old woman arising from the broad ligament and confirmed on immunohistochemistry. Most of these tumors behave in a benign fashion but certain histological features like hypercellularity, cellular pleomorphism and nuclear atypia as seen in the index case may increase the rate of recurrence and metastasis. Therefore, close follow-up is recommended for FATWO. Synchronous epithelial or mixed epithelial and germ cells tumors in the same ovary is a recognized event, however, having two different surface epithelial tumors in contra lateral ovaries is a rare occurrence; prognosis and pathogenesis of which is still not clear. 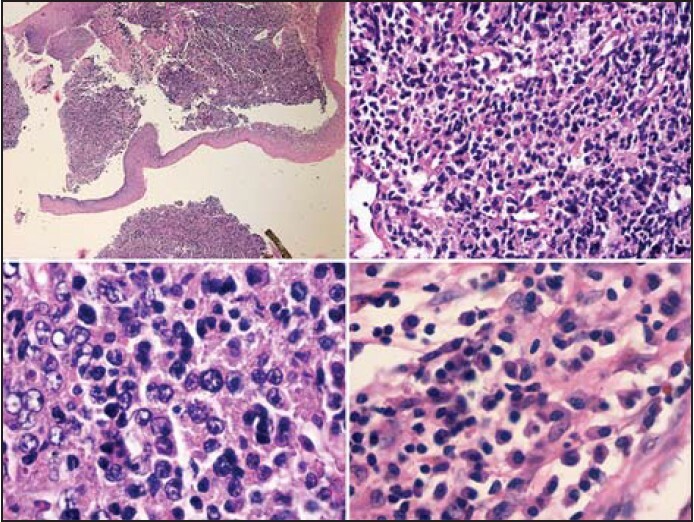 We came across similar finding in a 60-year-old female with different types of surface epithelial neoplasm in right and left ovaries at the same time; both of which were malignant. Clinicoradiologically only the left ovary revealed tumor, right ovary was atrophic. 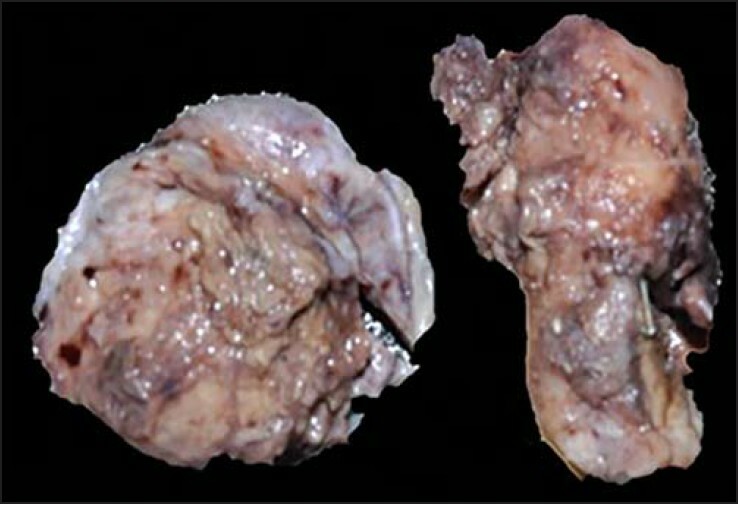 To our surprise, left ovary revealed high grade serous carcinoma and the right ovary displayed clear cell carcinoma. We performed immunohistochemistry to rule out the possibility of clear cell variant of serous papillary carcinoma. On literature search, we found; only single case with synchronous presentation of two different surface epithelial ovarian tumors in the same patient, both of which were benign. In India, hemoglobinopathies constitute a major genetic disorder and hemoglobin variants such as Hb S, Hb D Punjab, and Hb E are the most common ones. Other variants include Hb Q India, Hb Lepore, Hb J Meerut, Hb D Iran, etc. These variants show heterozygous state along with beta thalassemia. However, compound heterozygosities among these variants are very rare. 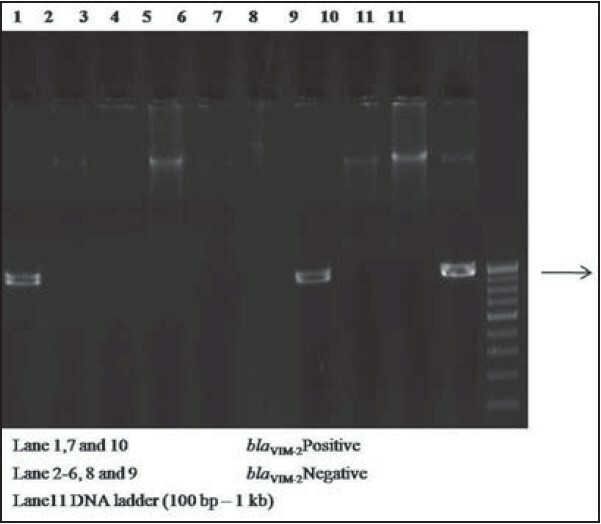 Ethylenediaminetetraacetic acid whole blood sample received for routine thalassemia screening was subjected to alkaline electrophoresis using automated capillary zone electrophoresis. Suspecting the presence of rare variants, further analysis was carried out using Bio-Rad D10 and Tosoh G8 high-performance liquid chromatography (HPLC) systems. Capillary zone electrophoretograms showed the presence of peaks in zone Hb A, Hb D, a fused peak in Hb A2, and a small peak in Z1 zone. 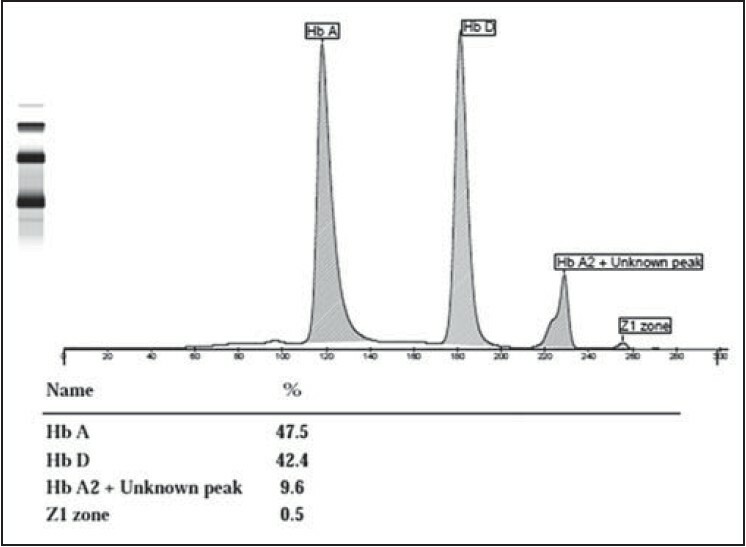 Bio-Rad and Tosoh chromatograms also indicated the presence of four peaks which are identified as Hb A, Hb D Punjab, Hb Q India, and hybrid of Hb D Punjab/Hb Q India. A peak in Hb D zone of capillary was due to co-migration of Hb D Punjab and Hb Q India variants. Small peak in Z1 zone indicated the presence of alpha chain variant Hb Q India. The findings were further confirmed by HPLC results and molecular genetic studies. 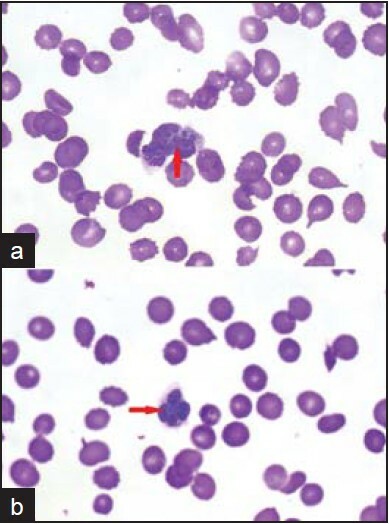 The present study reports for the 1 st time a rare hemoglobinopathy of double heterozygosity for Hb D Punjab, Hb Q India on Capillarys 2 Flex Piercing analyzer and is forth reported case for this rare hemoglobinopathy. Cast nephropathy is the most frequent pattern of renal involvement in multiple myeloma characterized by presence of tubular casts with characteristic morphology that are composed of monotypic (either kappa or lambda) light chains as seen by immunofluorescence microscopy. 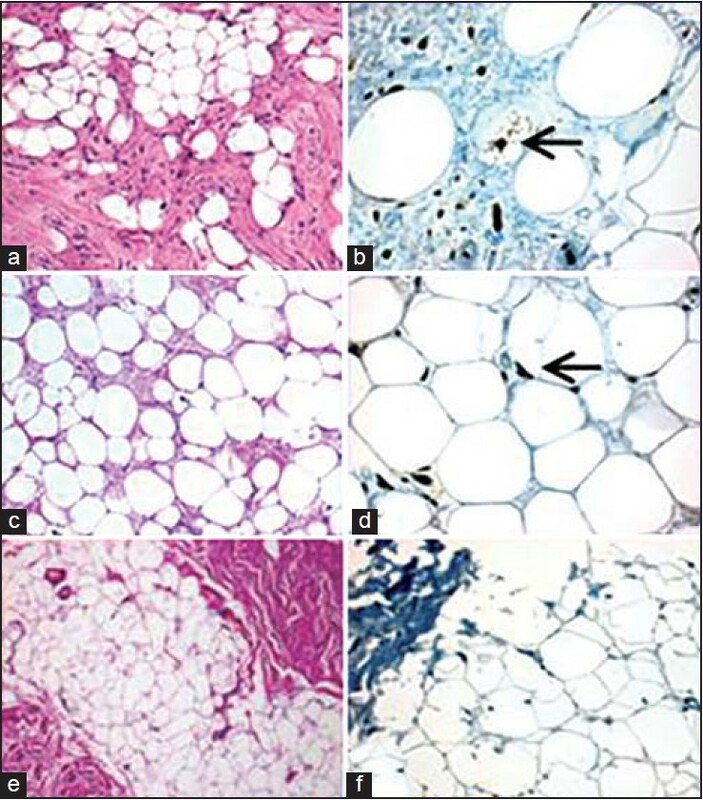 Rarely these casts may show evidence of amyloidogenesis and assume a unique morphology, which needs to be appreciated for arriving at accurate diagnosis. We present the case of an elderly male presenting with features of acute kidney injury and detected with extensive inspissation of intratubular casts with lambda light chain restriction and a unique morphology with spiculated congophilic periphery. Further investigations confirmed the presence of systemic myeloma. 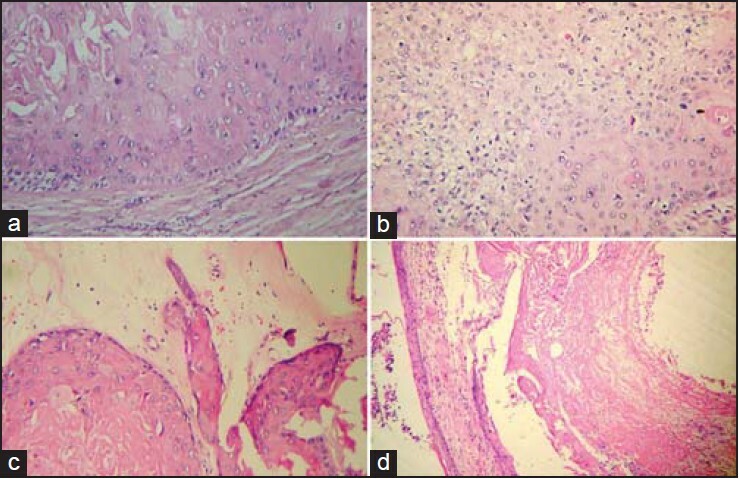 Presence of intratubular amyloid casts is a rare occurrence which needs to be recognized by the pathologist and forms a vital element in timely diagnosis of the systemic disease which often presents with renal involvement. Salmonella Enteritidis is one of the most important serovars transmitted from animals to humans and a serovar most commonly reported worldwide. Infection with Enteritidis is mainly limited to the intestinal tract, but under certain circumstances may cross the mucosal barrier to disseminate and get established as some localized infectious focus. Although cited as one of the very uncommon causes, Enteritidis may involve the liver and evolve into an overt abscess. 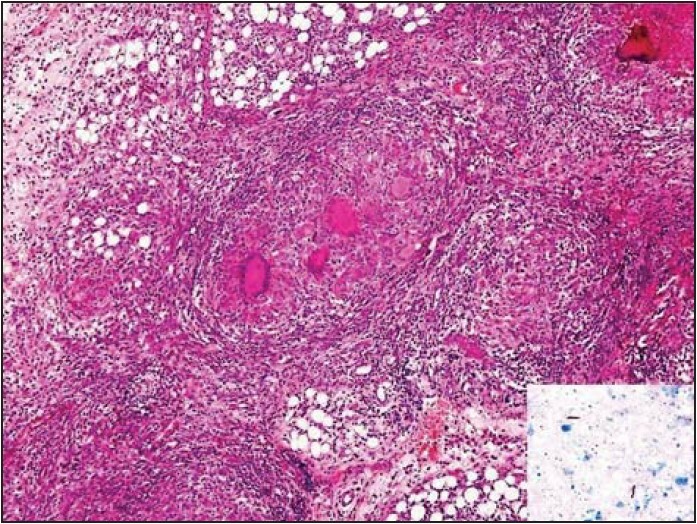 Pyogenic liver abscess by a gas forming organism like Enteritidis usually follow a serious fulminant course and associated morbidity and mortality is unacceptably high unless immediate therapeutic interventions are initiated. Scedosporium apiospermum previously known as Monospermum apiospermum is a ubiquitous fungus found in soil, polluted water and sewage. It causes broad spectrum of diseases, including soft tissue infections, septic arthritis, osteomyelitis, ophthalmic infections, sinusitis, pneumonia, meningitis, brain abscesses, endocarditis and disseminated infection. In recent years, it has been shown to be pathogenic for both immunocompetent and immunosuppressed patients. It is a significant opportunist with very high levels of antifungal resistance. 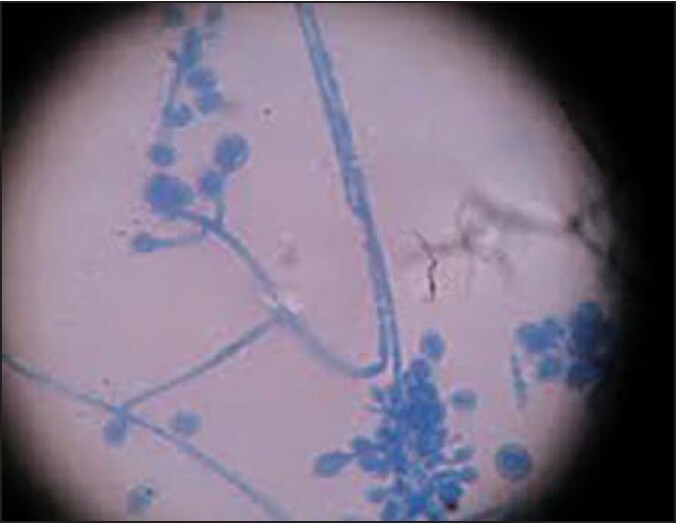 We report here a case of invasive lung infection due to S. apiospermum in an immunocompetent patient who responded to antifungal therapy and surgical treatment.